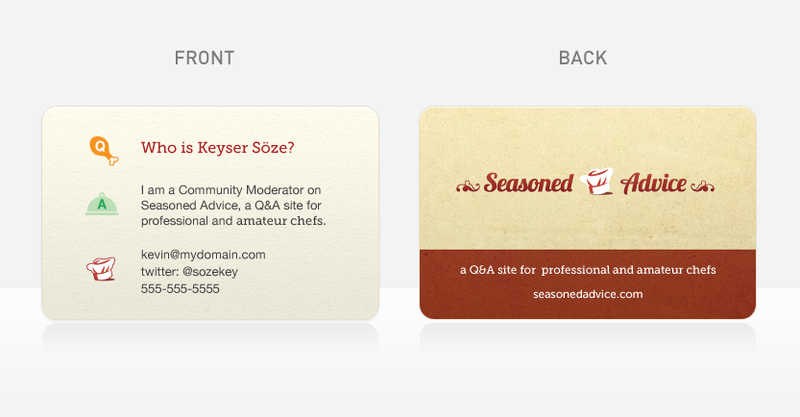 If you're a moderator, would you be interested in having your own Seasoned Advice contact card? Would you find it useful? I can see them being handy to pass out to friends, coworkers and family to promote our site. I think this is a great idea, and I'd definitely take a few. I frequently go to cooking classes and end up telling a few people there about SA, but I get the impression that it likely goes out of their mind the second they leave. Handing out a couple of these could really be helpful. If we wanted real name and user name on the card, should we do username as one of the contact lines? Does everything on meta.stackoverflow.com apply to Seasoned Advice? Is Seasoned Advice a misleading title? Is this a good question for seasoned advice?